You buy that trailer ? Could you let us know how much and where from ? My prepping consists of bugging out by bicycle so any comments are likely to be based on that scenario. Could you , if for some reason the bike goes kaput , pull it by hand ? poppypiesdad wrote: Could you , if for some reason the bike goes kaput , pull it by hand ? Yes, I've tried pulling it along by hand and there's enough room so that it doesn't catch your feet. The trailer will be high at the front while pulling it but as long as the cargo weight is reasonably balanced it is quite comfortable to pull. While the front end (tow bar) would be high, the rear is still clear of the ground by a few inches. At least it is for me at 5'10" tall. Great looking bike, only addition I would suggest is a USB Power Bicycle/Bike Dynamo Charger, get them from Ebay for £20 odd, great for powering sat/nav phone etc, or as I use a usb battery charger, always got charged batteries for my headlamp when camping. I have a hub dynamo on my other bike which is superb, but, on my INCH bike I don't think I'd be going far/fast enough to be of any use. My charging is taken care of with an Anker four panel 14w solar device which has two USB outputs. It will charge 4 x AAs at a time through two separate USB battery chargers. I think your bike and trailer looks awesome! And totally fun for weekends away for fun in the country as well (I will fit a dog trailer to mine ). I like as well, if combined with a bike rack and car, it gives another level of fall back in terms of transport speed and load capacity going car (with emergency bag, back pack bob, bike panier bags front and back, bike trailer bag, car bag) dropping down through the levels trougth to running for life having dumped everything except emergency bag. I like the stealth aspect very much for moving around and accessing foot paths. Also on the general fun camping, can drive to Scottish park, dump car, cycle further in and set wild camp and then hike around with the dog, rather than having to yomp everything in on my back from the car park. sweet! 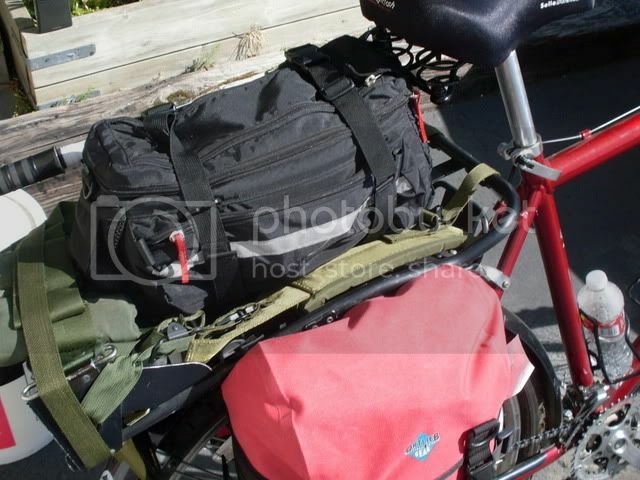 These panniers hold as much as my large ALICE ruck and a bit more. The bag on top holds the stove, FAK and bike tools. 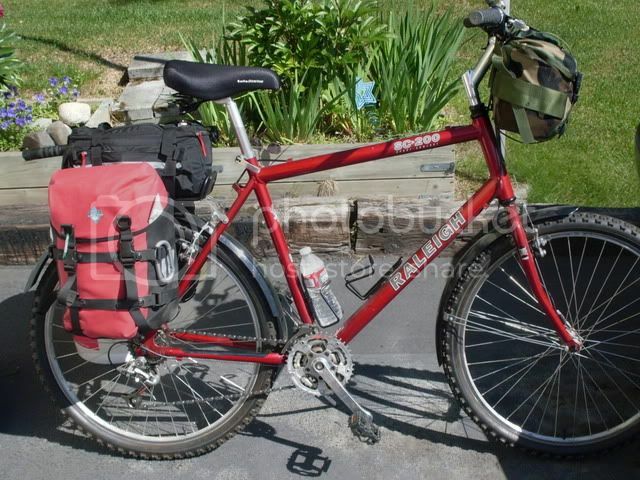 The odd pack on the handle bars hold about 4 days of food. If pedaling all day long (common here in Alaska) you can easily burn 5K or more calories. For fun, an LC-2 ALICE frame will fit on top of the Blackburn rack - the lot is held on with a pair of long straps. The bicycle is sold as a Sport Comfort. Basically a 21 speed Mt bike with more upright seating. I normally run very hi pressure (90 psi) tyres and knobbies when off road. Any ideas for carrying an air rifle or such like on a bike? An awful lot talk if wanting one especially bugging out, or would we be talking stripped down and put in a rucksack? Crossbows must be the most awkward thing to want to carry around, and Compound bows too for that matter, I know we have the offensive weapon laws to be concerned about, but in that scenario your bike/trailer even handcart are your home, I have to admit even though I'm not a bug out advocate for the most part, EDCs, BOBs, and Vehicles and what to pack are fascinating to me.